This is a fun way for your child to learn computer and mouse skills. Lots of fun activities in a single program. Features: Hide your eyes and count to ten. 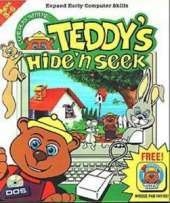 Join Teddy as he finds his cleverly hidden friends. Wonderful things are uncovered at every turn. Look carefully for hiding places. Click on objects to reveal their secrets. You never know who or what you'll find. Coloring is easy with mouse driven tools and brightly colored palette. Animate Teddy or one of his friends. Make them move in a lot of directions. You control the action and the speed. A sliding puzzle game teaches coordination skills using the mouse. Find matching pictures to see the animals dance. Join Teddy on another fun filled adventure. He'll provide hours of fun for you and your children.